Bill Hardy, great grandson of founder Thomas Hardy, was in Scotland to present this tasting of his company’s premium wines. I was kindly invited along, and to dinner afterwards, where several of the wines could be enjoyed with food. I sat with Bill throughout the evening and found him to be a genuinely modest and somewhat shy character, who nonetheless is fiercely proud of what his family company has achieved (though BRL Hardy is now in corporate hands) and the standards for which it continues to strive. Founded exactly 150 years ago, Hardys was at one time the biggest winemaker in Australia. They survived a series of rocky times in the first half of this century, including the destruction of Hardys main cellars by fire and the death in an air crash of Bill’s grandfather. The company slipped to around seventh position in that time. Now, BRL Hardy is one of the world’s top ten wine companies with a turnover of half a billion Australian dollars and a whole stable of labels in Australia. The company also has winemaking concerns in New Zealand, Italy, Chile and the very successful La Baume in southern France. Their most recent phase of expansion has been by acquisition, buying up some famous wineries and vineyard sites like Chateau Reynella, Houghtons and Leasingham. Their business aim is to retain the identity and winemaking philosophy of their brands, yet to bring about the economies of scale afforded by a company of their size. In this way they see that they can counter the threat from other New World players like Chile and Argentina, whilst their operations in France and Italy give them an opportunity to get involved in the wine renaissance that is underway in traditional areas. Bill himself is a winemaker, who studied agriculture in Australia and then went on to study oenology at the University of Bordeaux in the 60’s. This makes him amongst the earliest Australians to study at Bordeaux, and one of the last to study under Professor Emile Peynaud, the father of modern winemaking. 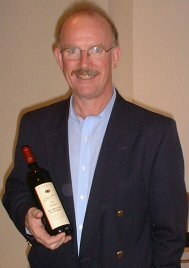 Though interested and knowledgeable about terroir, and how Australian experiments with matching vine to soil continue, Bill’s philosophy is very much to blend the best fruit from wherever it is available, so few bottlings are “single vineyard”, but a blend form fruit selected across a region. I enjoyed this tasting. I have been very impressed by Hardys wines over the years, from their mass-market brands like Nottage Hill and Banrock Station, to their top-notch, typically Australian blockbuster E&E Black Pepper and Eileen Hardy Shiraz. A very unusual blend here: the two most familiar white wine grapes are often blended with other varieties, but I’ve never come across them being blended together before. Bill explains that they hoped adding around 15% Sauvignon Blanc would add a little edge to the wine, cutting the usual weight and some would say flabbiness of New World Chardonnay. Pale green/gold colour. Interesting aromatically as a liquoricy spiciness and peachy fruit is sharpened-up with an apple and citrus freshness. On the palate there’s a buttery rounding-out of crisp lemony fruit. Easy drinking and quite enjoyable. Moderately deep golden colour. Huge toasty, charry new oak nose with a leesy richness suggesting brazil nuts and butter, lots of spice and cinnamon and good, ripe fruit. On the palate fine fruit quality too that is quite cool and elegant, with pear, apple and riperpeach flavours. Medium to full-bodied this is balanced by nice acidity and is quite long. Aged in 100% new French oak, the fruit is mostly from Padthaway as well as cool-climate Yarra Valley and Adelaide Hills. It is a glowing, burnished gold colour. It has a nicely rounded and nutty nose with densely packed fruit of melon and peach. There’s a leesy, creamy quality too with unctuous tropical nuances. On the palate this is much tighter than the Reynella and has a streak of citrus acidity that clamps down on the finish. It is medium-bodied, complex and is nicely savoury and nutty with good length, though it is fully mature now. Dense ruby/crimson colour. Bold black fruit aromas with a little herbal leafiness and suggestions of mint, with beneath some plummy, darker aromas. On the palate there is spicy oak, but the main impression is of juicy, ripe, soft mulberry and chocolate with moderate, ripe tannins and good acidity. Very chewy and full-flavoured, but easy to drink. This is a perennial favourite of mine, and a recent bottle of the 1994 was just delicious. It has a vibrant, deep crimson colour. The nose has lovely plummy, creamy, dusty blue/black fruit aromas. On the palate there are plenty of fine tannins gripping berry and plum fruit, with good ripeness giving a sweet depth. Acidity is quite high, pushing forward into the long finish. This will be better in a few years I’d guess. Leasingham was bought in 1988, from the Heinz food corporation of America, so a bit of reclaiming of Australia’s wine heritage. This wine has also fallen in price from around £20 retail due to restructuring of Hardy’s brands and to me represents excellent value. Very dark, opaque purple black colour. Massively ripe in that highly-perfumed, Porty style with mulberry, plum, clove and chocolate. There’s a great sheen of vanillin oak (this wine is aged in small 50 gallon Bourbon barrels) with smoke, spice and great sweetness. Lovely quality of fruit on the palate that is tight and focused, creamy and concentrated. Medium to full-bodied, there is plenty of grip into the long finish and balanced acidity. Has the capacity to age well. 85% of the fruit is McLaren Vale, the rest from Padthaway. This wine was first created for Bill’s grandmother, Eileen. 500 cases of the wine were bottled as her annual birthday gift from the company, made from the very best selected cuvées. The colour is again massively deep, dense and vibrant. There’s a charry, dark-roasted coffee bean, nutmeg and spice note on the nose but also intensely minty fruit with nuances of black pepper, tar and liquorice. On the palate that quality of fruit continues. It is very concentrated and very long, with medium-body and fine tannins. The finish is long and shows fine balance. This is a 50/50 collaboration between Hardys and a syndicate of growers in the Barossa Valley. E&E is named after two of the founding group of old German growers who have farmed the Barossa for generations, both of whom were named Elmore. The fruit comes from the north of the region around Kalimna from old, unirrigated vines (very rare in Australia) some over 100 years old and with very low yields. This glossy purple/black wine has soft, sweet, seductive aromas of ripe berry fruit with hints of camphor, mint and eucalyptus. The palate is wonderfully juicy and full with a pure core of rich fruit and fine background tannins. It is basically a straightforward fruit-bomb style, but very high quality and very classy with a long, focused finish. I tasted the 1996 vintages of this and the Eileen Hardy side-by-side this time last year and had a distinct preference for the Eileen Hardy. This was a much closer call for me. The 1997 vintage in general is a little weaker than 1996, but without a doubt both of these wines are very fine indeed. My first experience of this wine which comes from Frankland River, on Australia’s West Coast. It has an intense purple/black colour and a lovely sweet, slightly jammy nose of eucalyptus dusted with black pepper and chocolate. The palate is full-bodied and thick with powerful blackcurrant fruit dominant, but a rich, bittersweet dark chocolate concentration. Good, sweet tannins and a purity of dusty black fruits into a long finish. Very good indeed. Six years old and still a very dark, dense ruby. Sweet and mellow on the nose with creamy blackcurrant laced with a much firmer plum skin and black cherry edge. The palate is very grippy with firm, mouth-drying tannins. The fruit is savoury and chewy with a leathery toughness at its core, but plenty of leafy, lightly minty blackcurrant. Medium to full-bodied and with excellent length, the spicy tobacco oak shows up in the finish which is very clean with moderate acidity and plenty of fruit. Very good again.